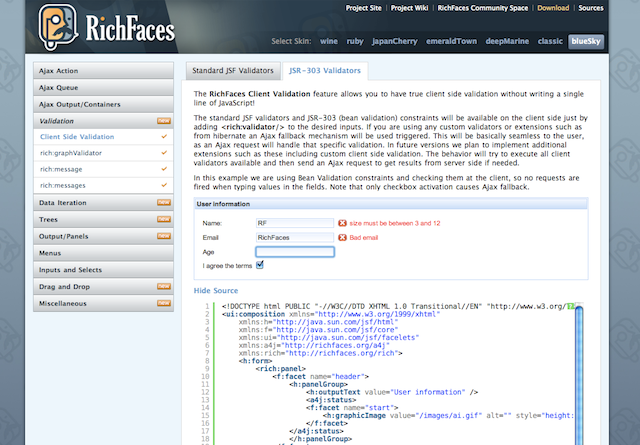 Application contains basic usage samples for all RichFaces components and features migrated to RichFaces 4.0.0.Final. Check build instructions for richfaces-showcase and other samples. Demo application for the RichFaces 4 Push component. It's completelly redesigned in difference to RichFaces 3.x version. Now using Comet/WebSocket at client side and JMS/Atmosphere at server side it became really powerfull mechanism for real-time client side updates according to the server side events! Application contains basic demos for all RichFaces components and features. NOTE: There could be some issues running samples at JEE6 containers. E.g. them could not be run as-is at GFv3 because Seam 2 / Hibernate dependencies conflicts with libs bundled with application server itself. Real world demo built on top of RichFaces, Seam and Hibernate.